On the DVD for Star Wars: Episode I - The Phantom Menace there is an extended making-of feature titled "The Beginning" and in it George Lucas talked about his screenwriting process. At the tender age of twelve, when I first caught a glimpse of the film business via this featurette, I was not only enraptured in all that this world contained, but I was also struck by something the writer/director said concerning his action scenes. Lucas commented that rather than having a detailed description of the lightsaber battle he desired to create on screen it would simply say, “they fight,” on the page. This always struck me as odd considering the amount of planning that would seemingly have to go into such an involved sequence. It was too easy. I could understood Lucas’ idea of leaving the choreography and blocking to professionals who could better bring to life the style and aura of the battle he imagined, but to not even give an indication of what might have been in his brain always seemed a strange decision even if there would be countless meetings about it before the start of production. Even if it proved to be nothing more than a place to preserve those original ideas and remind himself, if no one else, of what inspired the sequence in the first place it would at least be that. This isn’t to say such an approach doesn’t work as I still believe that final lightsaber battle in The Phantom Menace to be the best the series has ever produced, but I bring this up to say that I’m pretty sure writer and director Edgar Wright didn’t simply insert, “they drive,” when he was penning the screenplay for his latest, Baby Driver. Rather, it would seem Wright, who is known for his ferocious energy and encouragement of innovative editing techniques, put on the paper every detail of what he wanted to happen in his action sequences as not only do they present a personality trait of the titular Baby as played by Ansel Elgort (The Fault in Our Stars), but they too are choreographed both in direction and motion. Motion meaning they not only hit the beats of an action sequence, but the beats of the soundtrack Wright has written the film to and integrated so intricately it would be impossible not to describe how exactly they went down if he wanted anyone else outside himself to understand his vision. This is all to say that Baby Driver is yet another unique and wholly original creative endeavor from a filmmaker who not only continues to push himself to come up with different ways to bring our similarly diverse world to the screen, but who captures an essence of cool in his work that we all aspire to have. Wright crafts the ideal out of situations that are not and Baby Driver is no exception to the standard he holds himself, and movies in general, to. Debora (Lily James) and Baby (Ansel Elgort) get to better know one another. After completing his Cornetto trilogy that consists of Shaun of the Dead, Hot Fuzz, and The World’s End, as well as directing what is arguably his beast feature in Scott Pilgrim vs. the World Wright was once attached to write and direct Marvel Studios' Ant-Man, which he’d been working on since before Marvel became what it has become, but we all know how that turned out and in the wake of what was no doubt a crushing disappointment turned to a project that seems to have been gestating for quite some time. The kernel of the idea for Baby Driver is golden: a getaway driver with a music obsession due to an accident in his past falls in love and wants to get out of the game, but can’t and the music he adores and creates scores the craziness that ensues when he begins taking matters into his own hands. It is a symphony of action, a musical set to how the cars maneuver, a crime caper that inserts melody for cheap threats and rhythm for gunfire. It begins by knocking our socks off right out of the gate as Baby waits on a team of bank robbers that includes Buddy (Jon Hamm), his wife Darling (Eiza González), and Griff (Jon Bernthal) while jamming out to The Jon Spencer Blues Explosion’s “Bellbottoms”. The trio of robbers rush out of the bank and into the back of Baby’s red speedster as he takes off with cop cars hot on his tail. Speaking to the first paragraph this first action sequence speaks volumes as to why it is so clear Wright didn’t simply say, “Okay, we need a chase sequence here-what’s everyone got?” and take recommendations on the best, most efficient way to shoot a standard car chase. Rather, the chase is the dialogue in this movie. Elgort’s Baby doesn’t say too much and thus lets his skills do the majority of the talking. As he weaves through traffic, alleyways, and under bridges where he camouflage’s his ride among the other cars on the Atlanta freeway we don’t necessarily notice, but take note of the subtle yet specific ways in which the getaway is being conveyed. “Bellbottoms” continues to blare on the soundtrack as Baby hardly adjusts his posture despite the chaos taking place around him-the tension never seeming to concern him, the situation never seeming to shake his confidence. Buddy, Darling, and Griff move erratically wondering what Baby will do next in order to pull off the daring escape and, like the audience, they are equally amazed by the antics he is able to accomplish. We feel the same way about Wright. As the music fades and the titles appear on the screen we’re sold on the main idea already and its only as Elgort exits the car, grabs some coffee, and begins to dance down the street to Bob & Earl’s “Harlem Shuffle,” that we realize just how invested we already are despite the fact we haven’t heard a peep from the movie’s main character. “You know why they call him Baby, right?” Buddy asks after Griff attempts to push Baby’s buttons because he doesn’t like the fact the kid never speaks and doesn’t share many of the same criminal qualities as he. “Still waiting on his first words,” Buddy finally says answering the question he posed. So yeah, beyond the care and attention to detail that goes into every camera set-up Wright seems to take his meticulous time on there is also a plethora of sharp and often funny dialogue. And while the flippant tone and effortlessly cool vibes are to be expected from any Wright picture so many of them have also carried the presence of so many of the same actors that one of the more interesting aspects of Baby Driver was always going to be seeing how new players might operate within a world as created by Wright. How well would they pull off the multi-layered dialogue? Would they “get it”? It was a question that came up most prominently with the casting of Elgort in the lead, but not because I necessarily questioned the guys talent (he was fantastic in Fault), but only because I hadn’t seen him in much else and the lead in an Edgar Wright film was certainly something vastly different than a YA adaptation. As B-A-B-Y, Baby Elgort possesses enough of the innocence required to have us believe that despite his seasoned skills this isn’t a lifestyle he wants to become overly familiar with. There is also a necessary swagger one must have if they’re going to dance down a street or create mixtapes out of conversations they record throughout the day and while Elgort certainly has an air of indifference about exactly how good of a driver he is he contrasts this casual attitude with his genuine passion for the music and the fact it has to be just right in order for him to perform at his most exceptional. Elgort arguably shines most in the romantic angle that plays heavily into the story as opposite the lovely Lily James (Cinderella) he is unable to help himself when it comes to actually expressing himself. As Debora, James is a bit of an unpredictable foil as she is invested sooner and with sincere interest quicker than one might anticipate while firing on all cylinders when it comes to understanding Baby’s mentality faster than anyone else he might have encountered in the past. That she is so naturally able to adapt and get on his level is likely why the romance blossoms so naturally, but it is the scenes between the two that Wright shoots almost as if the two were in a music video where the visual and music cues tell us as much as the snappy dialogue the two exchange that really allow the sparks to fly and the vibrations of the soundtrack speak. Equally as fantastic as Elgort and James together is Jamie Foxx as a wild card of a criminal named Bats. Foxx is clearly having a blast and it shows as his charisma oozes out of the screen while at the same time making the audience relentlessly uneasy about what he might do next. Foxx arguably gets some of the films best dialogue with the price of admission being worth his performance alone never mind the abundance of everything else that is charming, entertaining, and fun about Baby Driver. 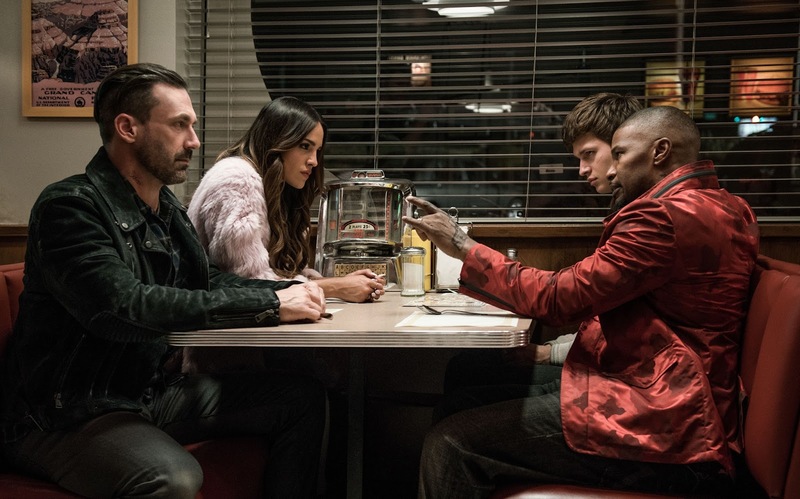 From left: Jon Hamm, Eiza González, Ansel Elgort, and Jamie Foxx star in Baby Driver. Baby Driver is a fantastic film, there is no doubt about that, but that isn’t to say it’s without issue. It is with no joy that I say Baby Driver is probably the least of Wright’s efforts and that’s only because I haven’t re-visited Shaun of the Dead recently enough to make a fair call, but due to how much that film is ingrained in my youth I find it unlikely it would knock it from its current ranking. This shouldn’t be taken as a knock against the film, either. 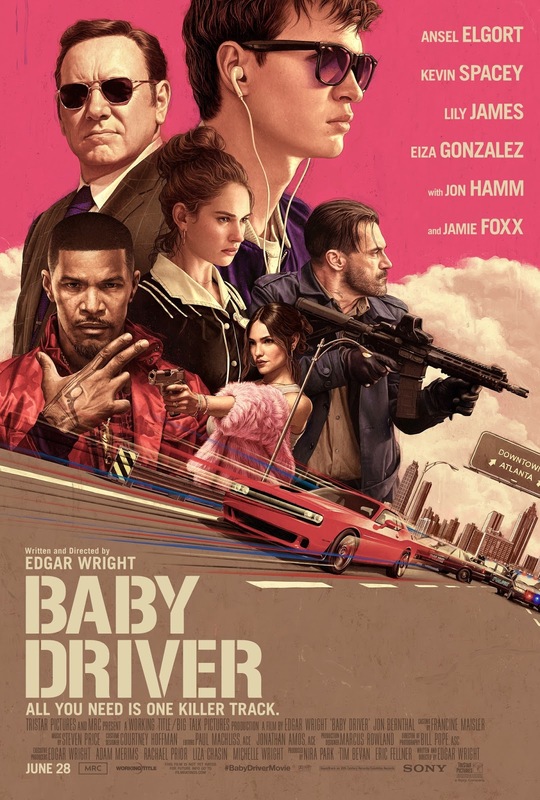 Wright has put out phenomenal work from the beginning and the fact that the least among his output is Baby Driver only makes a point to the quality of his work overall. Why is Baby Driver the least of Wright’s features then? It begins with the fact that while Baby Driver has all the hallmarks of a Wright film in the inventive transitions, the clever dialogue, and a blending of genres you didn’t necessarily know would work, but do so in seemingly effortless fashion in the hands of such a filmmaker there still remains the fact that with Baby Driver there doesn’t seem to be anything Wright is particularly interested in exploring. With the Cornetto trilogy you saw Wright, Simon Pegg, and Nick Frost tackle something bigger than the genre they were spoofing; Shaun had a discussion around consumerism, Hot Fuzz talked about conformity, and World’s End was an ambitious take on coming to terms with our own failures as human beings and facing why things might not have turned out the way we saw our lives when we were younger and more optimistic. To each of these was something that felt like more than just a comedy of errors or a genre mash-up for the hell of it, but they were crafted with intent and purpose-they were meant to affirm our individuality in more ways than one. Maybe Baby Driver is the result of exploring such ideas and themes-it certainly is a middle finger of sorts to an industry currently thriving on a lot of mindless conformity, but that only allows the essence of the film to resonate and not the weight. Of course, most will counter that not every movie has to deal in some heavy or heady subject matter and that is true-movies can and in a lot of regards are meant to be nothing more than fun. I can accept this, but that still doesn't change the fact that for all Baby Driver’s style the substance is more the lacking factor this time around. Still, I’d be remiss if I didn’t note that I was slightly disappointed Wright didn’t have that little something extra up his sleeve here. It also doesn’t help that it feels Wright’s creative juices begin to wane ever so slightly in the second act before jumping back up with a hip-hop inspired climax (Young MC makes everything more fly). The film feels like it goes on for just a tad too long though this is likely a result of the few pacing issues in that second act that, while largely unpredictable, doesn’t go down as smoothly as the exceptional first act of the film. I do legitimately hate to sound as if I’m coming down on the movie or being negative in any sense because Baby Driver truly is one of the most entertaining and fun experiences I’ve had at the theater so far this year. It features a quirky, but always groovy soundtrack and the intricacy of every shot and integration of every song should not be undervalued. I only wish they would have come to mean more to me by the time the credits rolled. That said, it’s not hard to forgive the film this discrepancy between it and Wright’s earlier work as this is still very much as looney as any Wright fan could hope-just like its tunes.